Framed by a processional cross, participants pray the rite before Cardinal Bevilacqua is entombed, Feb. 7, 2012. 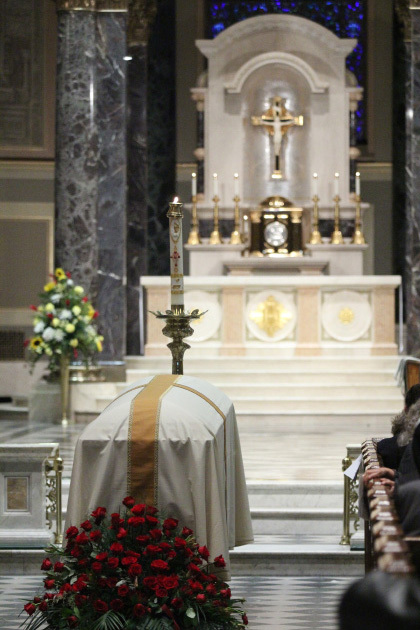 Cardinal Anthony Bevilacqua was laid to rest in the crypt of the Cathedral Basilica of SS. Peter and Paul on Tuesday, Feb. 7, joining such illustrious predecessor Archbishops of Philadelphia as Archbishop Patrick J. Ryan, and Cardinals Dennis Dougherty and John Krol. Archbishop Charles Chaput, who was principal celebrant of the Mass, in final remarks spoke eloquently of the late Cardinal, his predecessor once removed, and the challenges he faced. “We’re each a mixture of success and failure, selfishness and self-giving,” he said. None of our title or public reputation, for good or ill, finally matters. The only thing that finally matters is to be a saint; a saint is someone willing to love and forgive others as zealously as God loves and forgives us. Love is the measure of every life, and before we weigh anyone else on that scale, we need first to weigh ourselves. God is the only accurate judge. He’s also the most merciful. 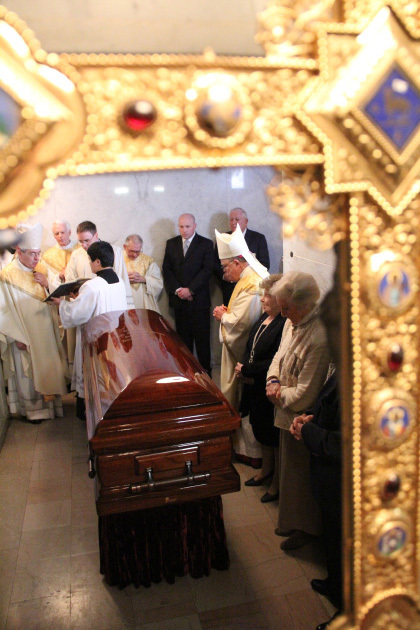 Cardinal Bevilacqua’s casket, covered by the pall, lay in state at the Cathedral Basilica of SS. Peter and Paul in Philadelphia Feb. 7, 2012. The final ceremonies in the crypt were performed by Cardinal Bevilacqua’s immediate successor, Cardinal Justin Rigali, who had preached the previous evening at a Vesper Service, following a viewing for the late Cardinal at St. Charles Borromeo Seminary. More than 1,000 people filled the Cathedral, for this final remembrance of Cardinal Bevilacqua who served as Philadelphia’s Archbishop from 1988 until 2003. Among them were members of his large family, including his surviving brother, Frank, and sister, Madeline Lagan; Archbishop Carlo Maria Vigano, apostolic nuncio to the United States, also cardinals, archbishops and priests; those who had worked with him over the years; friends and ordinary Catholics. Dr. John Haas, president of the National Catholic Bioethics Center, recalled it was Cardinal Bevilacqua who first brought him to Philadelphia as the first holder of the John Cardinal Krol Chair of Moral Theology at St. Charles Borromeo Seminary. “My children told me that when he called my house he would say it was Cardinal Bevilacqua and spell out his name saying B for buffalo, E for elephant and going though every letter of his name with some exotic animal. They remember eating pizza at his residence; he was a very kind-hearted man and we loved him. Not everyone was from Philadelphia; there those who came from Brooklyn who knew the Cardinal when he served there. Theresa Correlate remembers when he was just ordained and serving at Sacred Heart-St. Stephen’s in Brooklyn. She and her friends were hoping for high school graduation, but needed some help. Others, including Sisters of Mercy Ellen Cavanaugh and Marian Francis Kelly knew him from Philadelphia. Sister Ellen got to know him through working on the nine-year renewal leading up to the millennium. “He was a great priest and I can say no more, because that’s what he was,” Sister Ellen said. Sister Marian Francis’ association was only in the last year of his life, when she worked on his correspondence. “He was a wonderful man,” she said. Msgr. 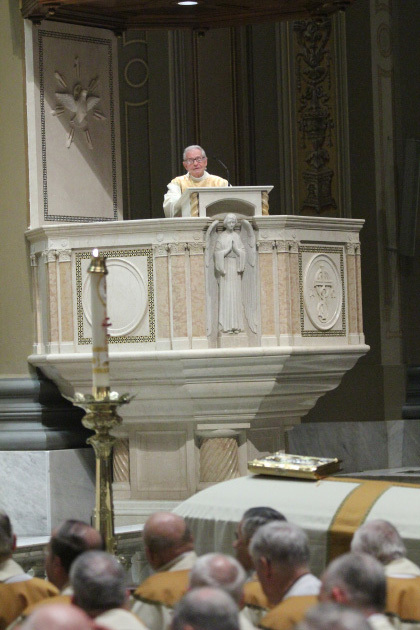 Louis D’Addezio preaches the homily at Cardinal Bevilaqua’s funeral Mass at the Cathedral Basilica of SS. Peter and Paul in Philadelphia, Feb. 7, 2012. The honor of preaching the late Cardinal’s funeral homily was given to Msgr. Louis A. D’Addezio, who was associated with him from his arrival in Philadelphia until his death. Msgr. D’Addezio, who was in charge of events surrounding then-Archbishop Bevilacqua’s installation in Philadelphia more than 22 years ago, told of the first event, a party for the Bevilacqua family the day the new Archbishop arrived. It was at the Philadelphia Museum of Art. He also spoke about the Cardinal’s love for children and at his orders the rejuvenation of the annual Christmas Party for children to make it a real party. Some of his final remarks were addressed to the late Cardinal himself.